Oh, I can't believe it's nearly Easter already. It was pretty sneaky moving Easter up to March this year! But here it is, this very weekend. 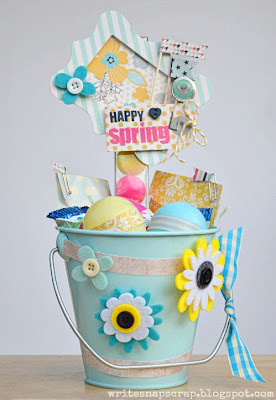 I made this happy pail that can be used as a little Spring decor, table centerpiece or as a gift. It was super easy to make. I starte with a plain painted bucket from a craft store. I used embellishments from Fancy Pants Designs to add a Spring touch to this bucket, using the Park Bench and Trend Setter collections. I decorated the pail with felt flowers, paper tape. The ribbon is May Arts. Inside the bucket are some plastic eggs stuffed with candy, then sealed with paper tape so little hands can't get to them! 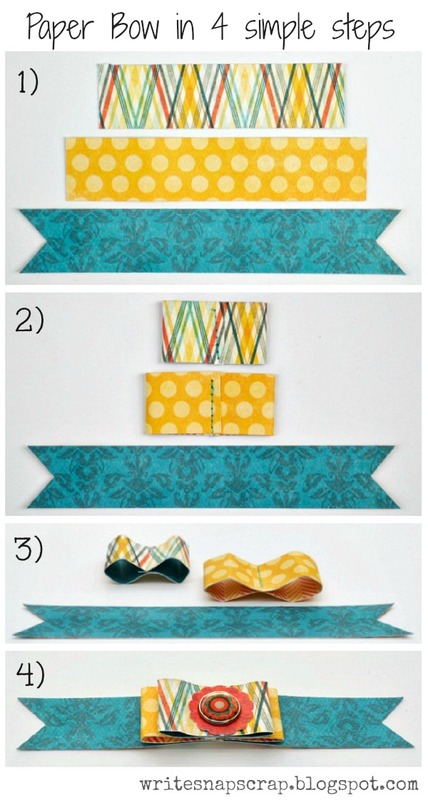 I also tucked some little treats inside two glassine envelopes and closed them with cute little paper clips. 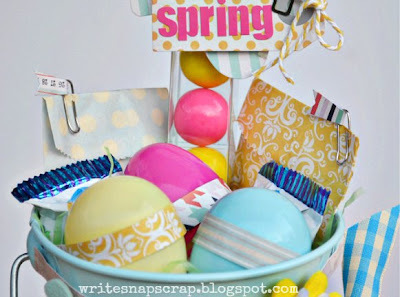 To give the basket some height, I added a gumdrop tube with a Happy Spring sign on top. Thanks so much for stopping by. Linking this to Blooming Homestead. Hi everyone. I hope you're having a good week so far. We are still in birthday mode over here. Cory turned 4 and is determined to have a week-long celebration. 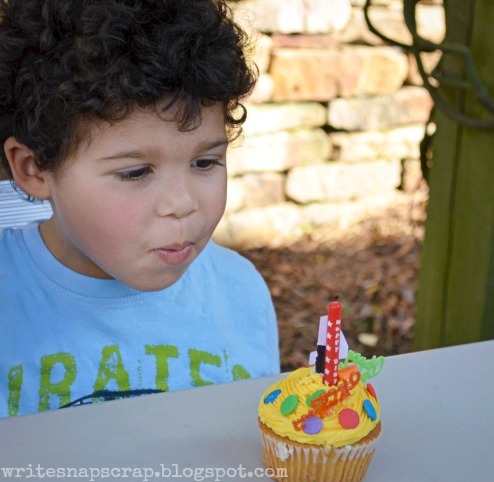 He makes a "cake" every day with his Legos and urges me to make a real one, light the candles and sing to him. I have indulged him more than once, I will admit. Today feels like a little celebration for me too. I have my first layout up on the Fancy Pants Designs blog! I'm so excited to be part of this design team. Here are a few close-ups of my page. 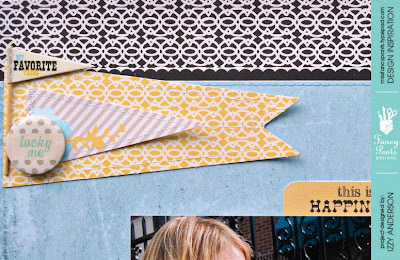 These pennants are part of a die cut sheet from the Park Bench collection. Just punch them out and stick them on. Easy! I thought it was fun to layer them and curl the edges a bit. All the new Fancy Pants collections from Winter CHA have these cute bitty bags with different designs. 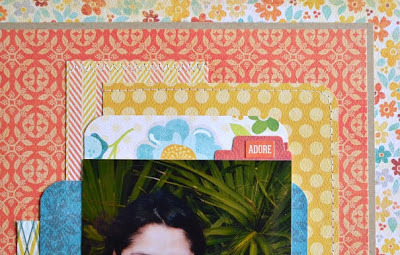 I tucked one under my photo and used it as a pocket for a journaling tag. 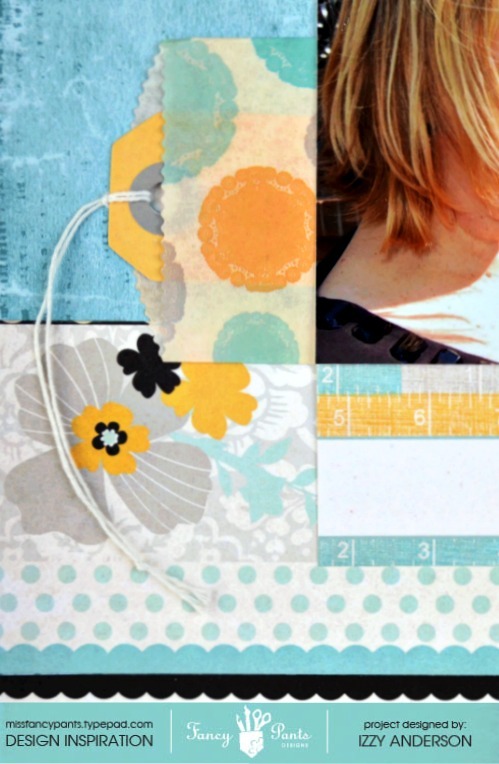 I usually made my own hidden pocket under photos and sometimes the journaling tag gets stuck in the glue. I love this solution with the bitty bag. No more stuck tags! My favorite Fancy Pants product might be the stencils. A few come in each pack and they have different quotes or icons. 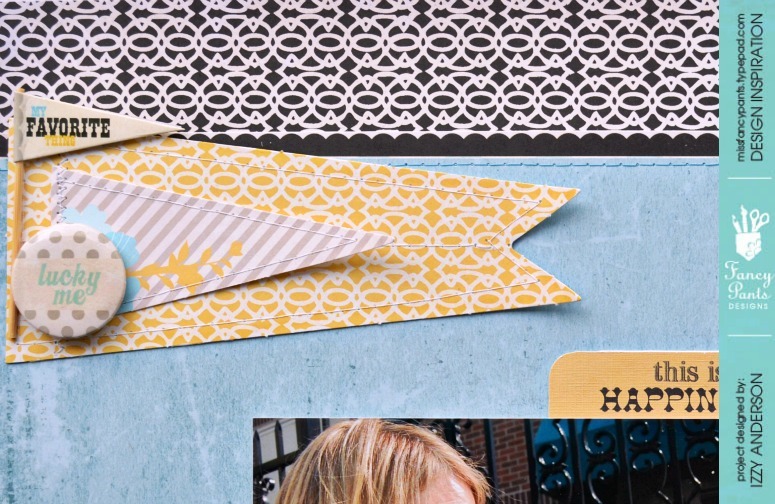 You can use the stencils as a mask or attach them to your page. I backed mine with paper, added a few banner stickers and stitched it to my layout. Thanks so much for stopping by. You can see all team's introductions on the Fancy Pants Designs blog. Don't you love getting happy mail then hate having to wait to tell it? It's so hard to hold good news inside! I have been bursting with excitement to spill this one: I've been named to the 2013 Fancy Pants Design Team. Squeee! Jodi expanded the team and I can't wait to work with all the Pocket Chicks! Here's the full list of the new team. I've already been given my first assignment but I can't spill that yet either. Instead, I'll share a layout I made with Fancy Pants last Fall of my little pirate. 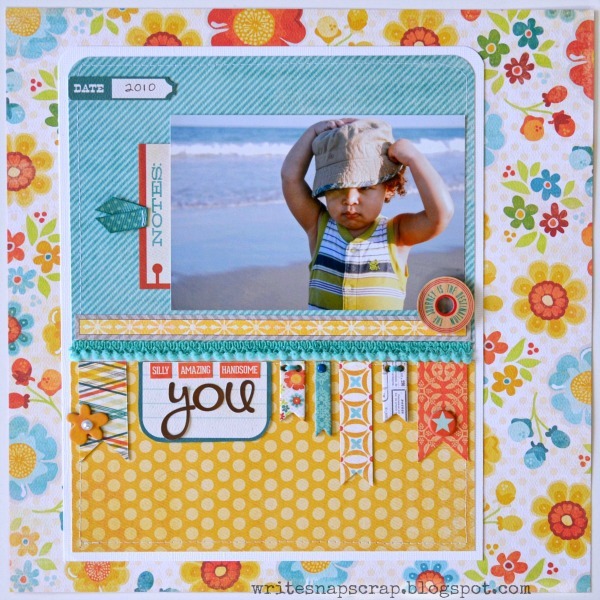 This layout used The Good Life collection. I love those chipboard frames. 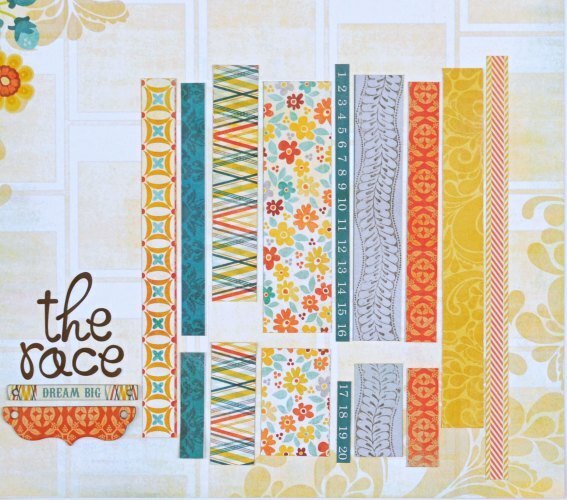 The full Design Team announcement is posted on the Fancy Pants blog. Thanks so much for stopping by! Hello and happy Friday! 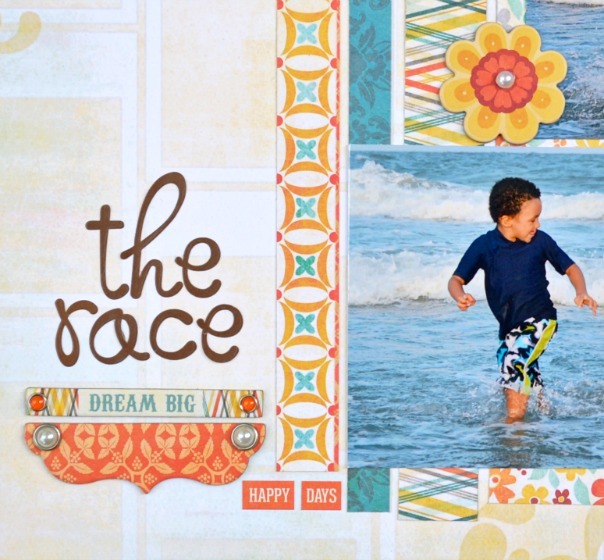 Today I have another layout that I made with My Mind's Eye, featured in the March kit at My Creative Scrapbook. 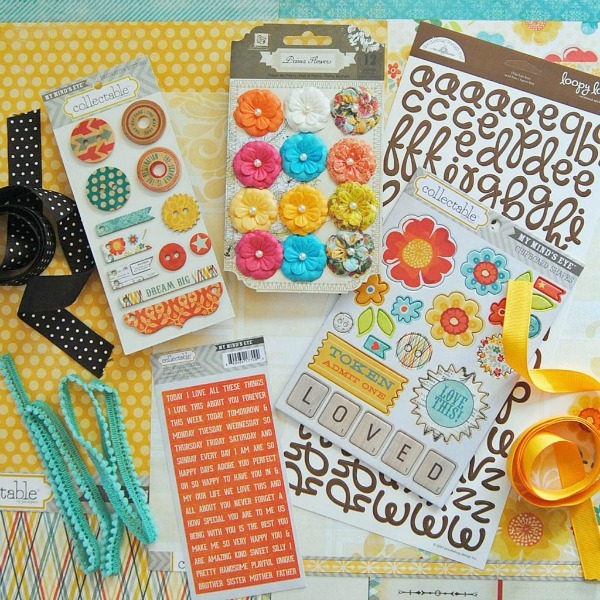 I also have a winner to announce from the PaperHaus Magazine spring hop. 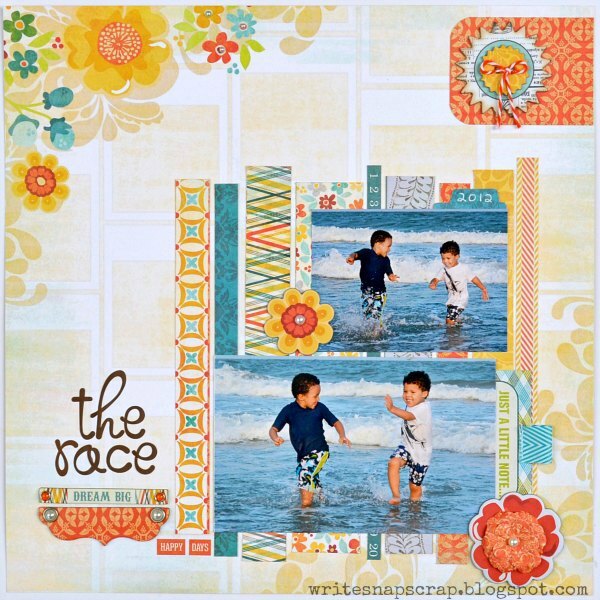 Let's start with the layout. When my son was 6 weeks old, we took a family trip to the beach. It was late April, but unseasonably warm, even for South Carolina. We put Cory in a little sunsuit, wrapped him in a blanket and took him down to the shore. I snapped this photo of my sister with him just as we were headed to the ocean. To draw the eyes to the photo, I made a colorful mat from a mix of patterns. It really was an excuse to use all the pretty paper! Now back to PaperHaus. 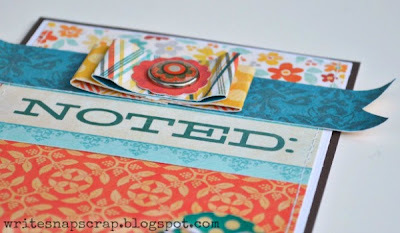 Thanks so much for everyone who stopped by the blog hop and left a comment. We are so excited about the Spring issue of the magazine. I had 42 comments on my post. I used random.org to pick a winner. Patty, I will email you to get your mailing address. Have a great weekend, everyone. 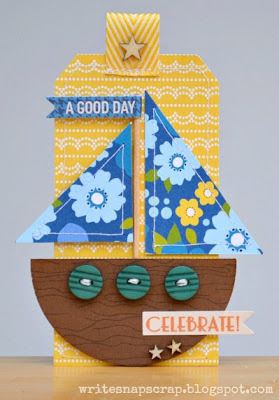 For the PaperHaus blog hop and giveaway, please see this post. 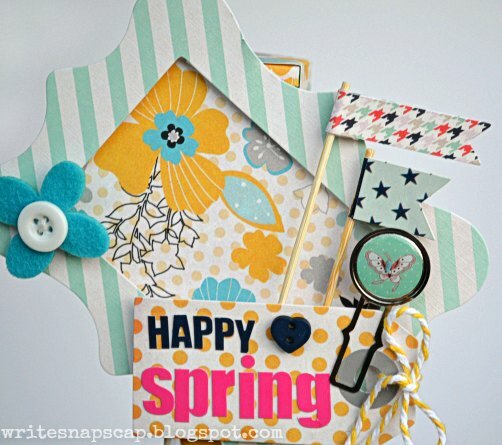 I had so much fun with the new March kit at My Creative Scrapbook. 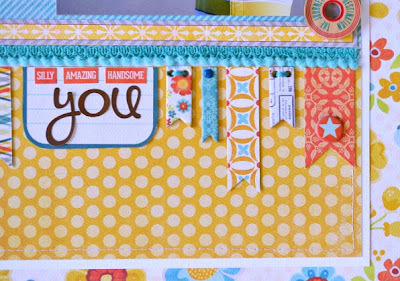 The colors and patterns of the My Mind's Eye line in the Creative Kit were just yummy and happy. If you look closely, you will see that the Polaroids are upside down, so don't look too closely! I turned the paper upside down because I liked the burst of color in the upper left corner and it gave me more design room on the rest of the page. 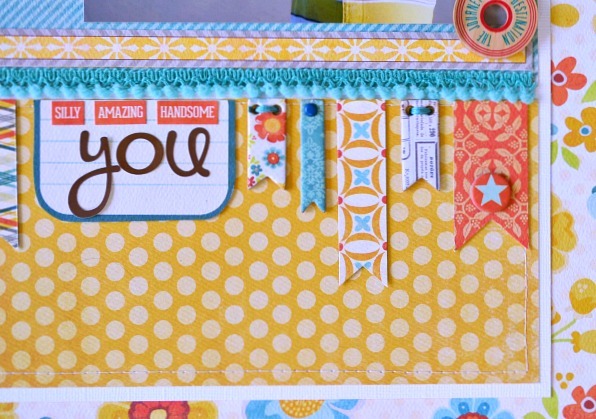 To make the large mat under the photo, I cut apart the border strip paper in the kit. I left a little bit of white space between each one and staggered them a bit to give a sense of movement. The photos fit nicely on the mat. I left a spot to the left for the title. Thanks so much for stopping by. I'll be back tomorrow with another project from the March kit and to announce the winner of the giveaway for the PaperHaus blog hop. It's almost reveal day! 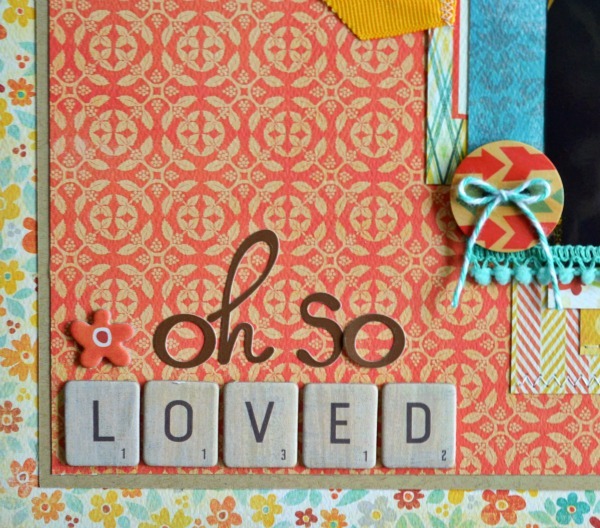 Tomorrow, My Creative Scrapbook reveals the new March kits. Oh, are they lovely! 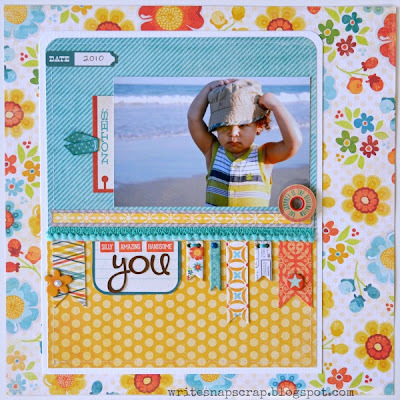 Pam, the owner, already gave away some hints on the My Creative Scrapbook blog so I think it's safe for me to say that two of the kits include new collections by My Mind's Eye and Little Yellow Bicycle. If you follow my work, you know that made me a happy girl! Tomorrow, I'll be be back with the full kit reveal. If you haven't entered the PaperHaus giveaway, you still have time. Entries are open until midnight Thursday. You can find the details here. Hello everyone and welcome. I'm so excited today to be part of the unveiling of the Spring issue of PaperHaus Magazine. 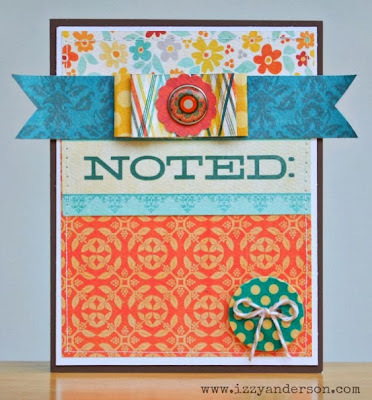 The contributors got together and are hosting a week-long blog hop. Yes, it's a big hop, but there are prizes at every stop! The hop runs through March 7. 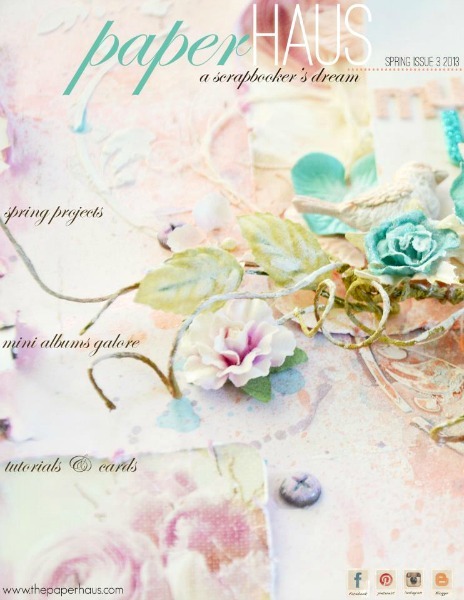 Here's the pretty magazine cover and the link to read the Spring Issue. I made a card to celebrate! 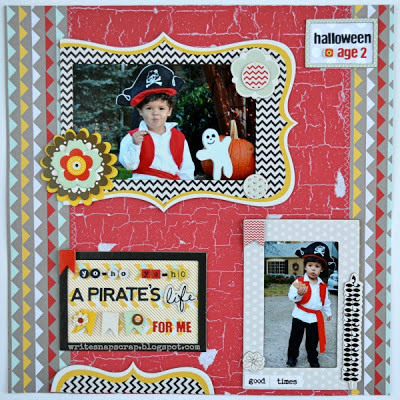 I used the Family Ties collection from Pebbles Inc. Stickers and buttons are October Afternoon, the stars are Studio Calico and the ribbon is May Arts. I also like it as a tag. 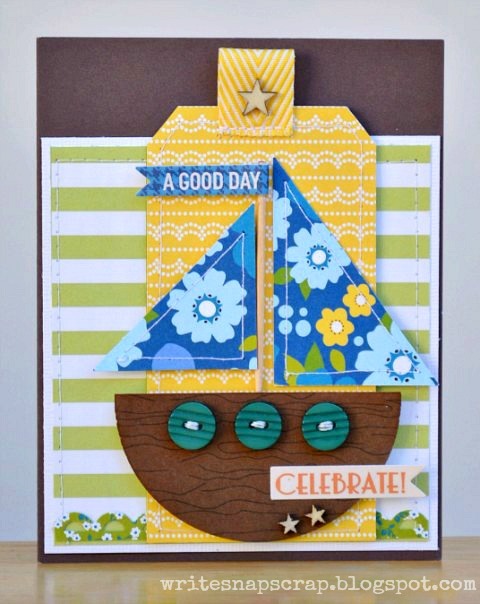 I made the sailboat from circle and square punches. 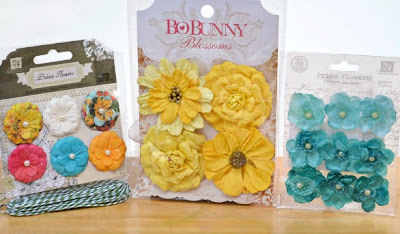 On this stop of the hop, the prize is a Spring flower giveaway plus 5 yards of green and white bakers twine. The flowers are Prima and Bo Bunny. To enter the giveaway, please follow my blog and leave a comment. 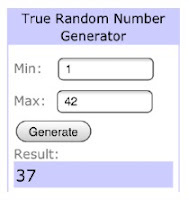 You have until midnight March 7 to enter. I'll pick a winner by random draw and post it on my blog Friday, March 8. Thanks so much for stopping by. If you are following the hop, you should have arrived here from Bente's blog. The next stop on the hop is Jennifer Grace. If you get lost along the way, you can find the full hop line-up here on the Paperhaus blog. You can also find magazine updates on the Paperhaus Facebook page.